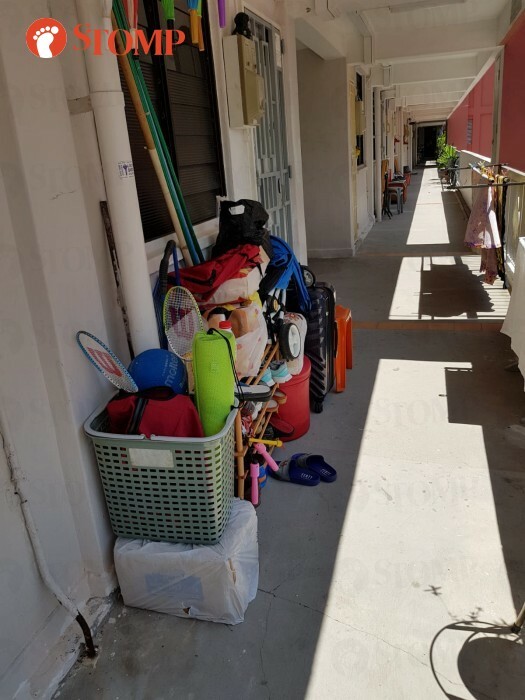 Stomper Bibi is frustrated with her neighbour at Block 6 Beach Road for leaving a protruding clothes rack and containers of items cluttered along the common corridor. She sent in pictures of the corridor taken on Dec 16 to Stomp, hoping that they will be cleared. Bibi said: "My neighbours have made the common corridor into a storeroom and laundry area of their own. "It has been this way for many months already. "I have tried to get them to remove their bulky items, but to no avail." The items include the protruding clothes rack to hang out laundry and big baskets and containers with items such as badminton rackets. 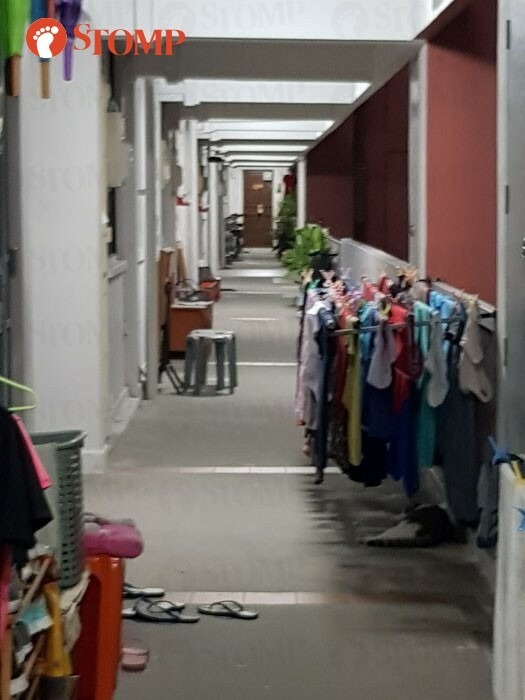 Bibi told Stomp: "I feel like they should not be leaving their items around the corridor. "I have to pass through the corridor daily. "When I was ill, I had to be on a stretcher. Even then, the stretcher could not be wheeled out. "When I travel, I face a lot of difficulty bringing my luggage out as the space to walk through is so small." According to the Singapore Civil Defence Force's website, the following are guidelines to follow when using the common corridor. While SCDF does not permit the storage of combustible materials along common corridors, we can allow for the placement of shoe racks, provided: It is for the sole purpose of keeping shoes, whereby, it would not constitute a substantial fire load. A minimum clear escape passage of 1.2-metre clearance is to be maintained from the parapet wall where the shoe rack is to be allowed. No objects are to be placed along common corridors less than 1.2 metres wide.